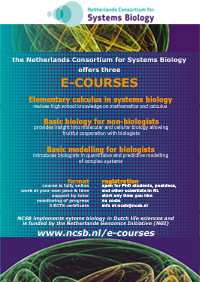 BioSB now offers e-courses in areas fundamental to Systems Biology. These e-courses were originally developed and offered by NCSB and cover the basics of Calculus, Cell Biology and Modelling. Over the last few years NCSB developed a web-based learning environment providing three independent basic e-courses in ‘Elementary Calculus in Systems Biology’, ‘Biomolecular principles of the Cell’, and ‘Modelling of Biological Processes’. These e-courses provide time- and place-independent education for those lacking background in these areas that are fundamental to systems biology. These e-courses will now be continued by BioSB. The three e-courses consist of video-lectures, texts to read and assignments to be prepared. Assignments are graded by tutors and returned with comments if appropriate. When all assignments within one e-course have been approved the student receives a certificate worth 3 ECTS. The level of the e-courses is basic and modules are open for PhD students, postdocs and other investigators holding a master degree and working in the Netherlands. Over the last few years ca 150 students participated in these e-courses and ca 45 certificates have been granted so far. For information and registration please visit www.ncsb.nl/e-courses. Further information is available from diman.vanrossum@ncsb.nl (SB@NL secretary) and a.w.schram@me.com (course coordinator).